Natural Edge Bowls are interesting to turn. For sure, each one is unique and many times (it depends on when the tree was cut) I am able to salvage the bark which really makes the piece nice. These and many of my salad bowls are generally turned green and allowed to warp to make them truly one-of-a-kind. Individually priced: $100 to $300. 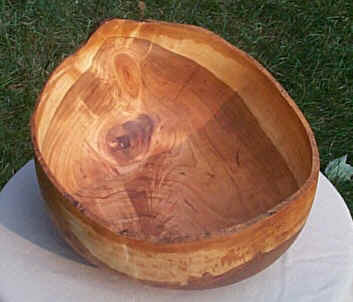 Click here for more examples of my natural edge and other salad bowls. When Plates and Trays get big and unique they become "Platters." 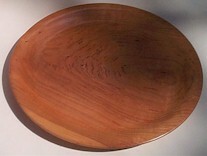 Sometimes I refer to myself as a platter freak because I like the way they show so much of the grain of the wood. Often I carve three feet on the bottom to ensure that if they warp slightly (and it is impossible for a large flat piece of wood not to move) they will always sit flat on the table. Click here for more examples of my Platters. Hollow Vessels are in my sights for future concentration. The only hollow work that I have done much of are Christmas Tree Ornaments. None for sale at this time.